This is one of our core technologies. We named it as the “「3D-Reon」”. Our 3D-Reon made it possible to transform any existing 2D images such as those on the DVD or Blu-ray into the 3D images. (1)First, the ３D-Reon processes the imported image in the unit of a pixel without putting it down onto any memory device, starting from the import through its output. The first step is to import the pixels sent from a player of DVD or Blu-ray. (2)Second, it calculates the z-value (depth) of the pixel, and then calculates the right and left amounts of the transferred pixels, based on the calculated z-value. (3)Third, it calculates where to display on the monitor screen in the observer’s eye based on the amount of the transferred pixels, and calculates the exact location (X, Y) of the right and left pixels individually while correcting any missing parts and flaws. (4)Fourth, it newly calculates the displaying location (X, Y) of the individual pixel of the right and left pixels so that it matches to the format of the displaying device. (5)Fifth, it produces a compounded pixel. (6)Finally, it completes the processing of one pixel by sending out the produced pixel to the producing device. The 3D-Reon repeats the processes from (1) through (6) above. (7)In usual display devices, images are imported and displayed according to a certain fixed protocol, and, in addition to the same function, the 3D-Reon can produce, without delay, 3D images exported one after another from a DVD or Blu-ray player by the processes described as from (1) through (6). (8)The 3D-Reon realized high speed processing with less memories by not recording and maintaining the processed results on the memory medium. (1)In the automatic transfer of ２D/3D, one of difficult problems has been to calculate correct z-values. The problem has been too difficult for many developers to give up the development against this wall. Many of them tried to calculate the z-values based on the values of brightness, saturation and intensity of the image. When such base is adopted, there are cases that some z-values indicate extremely high value in such a place of the high-lighted area. As a result, some portion of the image stands extremely front, or extremely behind, necessitating correction work for them. One of usual methods for such correction may be cutting out such limited portions, and replace them with the ones with the correct z-values. When such cutting-out is made, the cut-out portions appear flat (this phenomenon is called as “backdrop”), and thus necessitating correction works to give them certain bulge, perception of concavity and convexity. 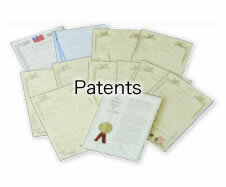 Such correction works directly affect the production hours, costs, and qualities, and constitute troublesome problems. As another method, we can do the wireframe modeling in advance, and paste the images to the wireframe. If the locations of the wireframe and the image perfectly fit one another, then, we can obtain splendid images. If not, however, this method may create bent images or distorted images. We hope you would understand how important, and how difficult to find correct z-values. In the calculation of z-values, the 3D-Reon uses the color recognition rate of human brains, i.e., human eyes in other words, for each pixel. Each individual pixel is resolved into RGB, and the color recognition rate is applied to each RGB, and then our own correction factor to each RGB. In this way, the 3D-Reon can calculate the z-values with few errors. Also, the created images by the 3D-Reon appear more natural, since the z-value is obtained for each individual pixel, and the concavity/convexity of the image is created in the unit of pixel. (1)In automatic transformation of 2D/3D, another difficult processing is the correction of flaws. When a 3D image is created from a 2D image, the pixels of the original image were transferred to the right and to the left in position on the displaying screen. That means, the original pixels become short in number. Also, the transferred pixels sometimes position behind pixels located in front because of the difference in the z-values, appearing as a flaw. This phenomenon is called as “crosstalk.” In the automatic transformation, it is necessary to make correction to them. (2)It is possible to avoid such crosstalk, if we make the depth and the concavity/convexity shallow. However, such processing has to result in the poor stereoscopic images short of the effects. Therefore, we manually cut out such portions separately in the same way as the correction of z-values for correcting the missing parts on the screen (this processing is called as “mat cutting”), and then, we draw the necessary pictures in the place of the missing parts. Once such mat cutting is performed, the cut-out parts become flat as in the case of correction of z-values, and thus, making it necessary to work out the flat parts for giving them 3D effects. 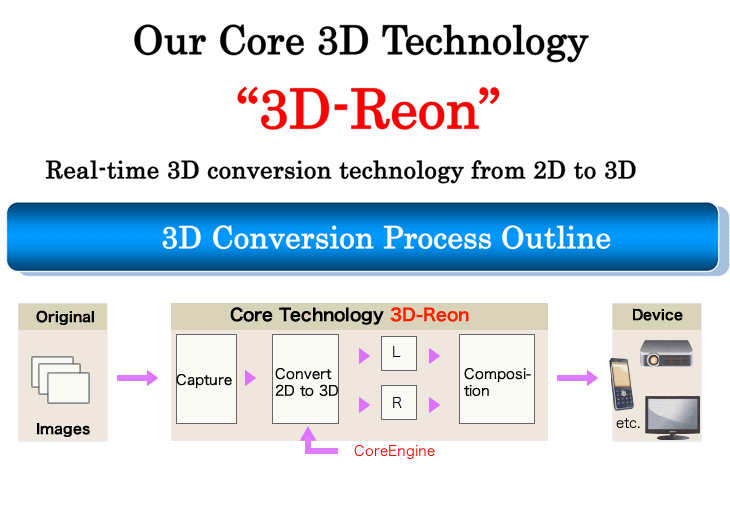 (3)Though the 3D-Reon cannot escape from the crosstalk phenomenon, the core engine of the 3D-Reon makes the correction fully automatic.